Cooking appliances are the heart of the kitchen. Cookers assortment offered by Deltaco Baltic UAB will make cooking process like a celebration for every user! The design of these products vary from minimalistic elegant to expressive retro. Innovative solutions ensure perfect cooking results. Gas overflow safety in ovens and burners: if the flame is accidentally extinguished by wind or by overflowing liquid, the flame failure device automatically cuts off the gas supply to prevent any gas leakage. Full glass door: easier cleaning and maintenance. 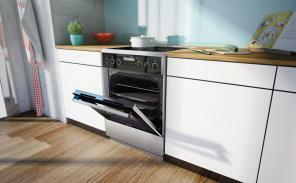 Easy removable side racks: ensure easier and more effective cleaning of the oven. Drawer for cooking trays: installed under the oven is easy to pull and perfectly fits for cooking trays and other accessories storage.